Dr. Emily Moers holds a Doctorate of Dental Surgery from the University of Texas Health Science Center at San Antonio as well as a B.S. in Biology from the University of Texas at Austin. After finishing her studies, she was excited to have the unique opportunity to join in practice with her father, and return to enhance the smiles of those in her hometown. Wanting to provide the best dentistry has to offer for her patients, Dr. Emily Moers sought out every opportunity to gain additional training in dental school. She was one of twelve students selected to complete additional hands-on training in Implant placement and restorative dentistry, and received training in Invisalign orthodontic treatment, CEREC / CAD-CAM restorative treatment, and cosmetic dentistry. She continues to remain active in a variety continuing education courses, and is working towards obtaining fellowship status in the Academy of General Dentistry. She is currently an active member in the American Dental Association, Texas Dental Association, Greater Houston District Dental Society, Academy of General Dentistry. 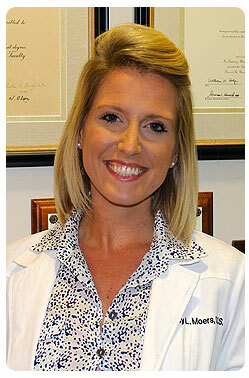 Dr. Emily is passionate not only about dentistry, but also about each patient’s experience in the dental office. It is her commitment that every patient leaves happier, healthier, and more knowledgeable of their oral health each time they visit the office. In her free time, Dr. Emily enjoys spending time with her husband, Travis and their rescue lab-mix puppy. When they aren’t working on ‘fixer-upper’ projects for their 1930s home in the neighborhood, they can be found fishing and relaxing at the coast with family.